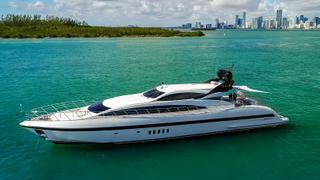 The 32 metre motor yacht U Wish, listed for sale by Tony Lazzara at HMY Yacht Sales, has had a $275,000 price reduction. Built in GRP by Italian yard Overmarine to a design by Stefano Righini, she was delivered in 2011 as a Mangusta 105 model and has had only light use since. Accommodation for up to eight guests in four cabins is on the lower deck and includes a master suite with an office and walk-in wardrobe, a VIP suite and two twin cabins, all with entertainment centres and en-suite bathroom facilities. In addition, there are quarters for four crew aboard this yacht for sale. With dark wooden joinery contrasting with designer fabrics, her upper saloon has comfortable seating, a bar and an entertainment centre including a large flatscreen television, and a dining area forward. The roof top is retractable at the touch of a button, giving the choice of dining indoors or al fresco without guests having to move from their seats. True al fresco entertaining is available on the vast aft deck, with built-in upholstered bench seating, a table and chairs. Meanwhile, her lower saloon is fitted with ample seating and an entertainment centre, offering guests the opportunity to simply relax and catch up with the latest offerings from Hollywood. She has wide decks leading to a pair of built-in sun pads on the foredeck — ideal for sunbathing with a cool drink in total privacy. Her twin 2,400hp MTU diesel engines have logged only 700 hours and, linked to KaWeMa water jets, power her to speeds of up to 34 knots. Lying in Hallandale Beach, Florida, U Wish is now asking $4,699,000.